Walking distance to Sundance Square, downtown Fort Worth's 16-blockentertainment and shopping district, noted for its unrivaled selection ofrestaurants, clubs and entertainment., Across the street from the hotel is theFort Worth Water Gardens, a beautifuland refreshing oasis adjacent to the Fort Worth Convention Center., 2 miles to the Fort Worth BotanicGarden and Japanese Garden. Theoldest botanic garden in Texas is knownas the “Sanctuary for the Senses, ” hometo more than 2, 500 native and exoticspecies of plants in over 100 acres ofgardens and natural settings., Situated near Fort Worth's crown jewels – such as the famous Bass Performance Hall and the Kimbell Art Museum – we bring Fort Worth flavor to everything we do. Because we're an Omni Hotel, guests know that long before arrival our fullattention is on making sure their stay is uniquely special. The room, staff and quality of this hotel were excellent! 06-Nov-2018 Verified Review, stayed from Fri Nov 02 to Sun Nov 04 2018 at a $167.48 average nightly rate. 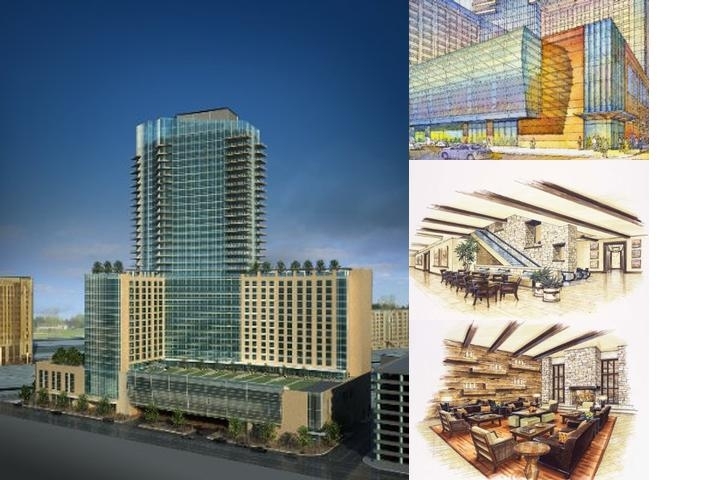 The Omni Fort Worth Hotel is a new landmark on thecity's storied skyline, with a personality as gracious andinviting as Fort Worth itself. You'll find we're casual, yet sophisticated andalways uncomplicated.Sculpted from native stone, rich hardwoods and wrapped in glass, this fabulous hotel is just steps from downtown Fort Worth's most exciting art and entertainment venues, from cultural to cowboy classics.Guests will also discover Texas treasures such as Bob's Steak & Chop House, a secluded hideout we call the Wine Thief and Whiskey & Rye, our sports lounge with live music and plasma TVs at every angle. We also have our own in-housemuseum store featuring selections from several private collections. Fort Worth is Texas through and through, so each one of our 614 spacious guest rooms and suites is themed with authentically-styled appointments like saddle blanket throwsand comfortable western-stitched pillows. Designed to meet your particular needs while exceeding your every expectation, the Omni Fort Worth Hotel offers an unforgettable hotel experience in one of the most uniquely memorable cities.Our property features nearly 68,000 square feet of flexible meeting space, including our 18,788 square-foot Texas Ballroom, plus all the wide-open, dynamic spaces you need to get down to business. An additional 400,000 square feet of functional meeting space is available directly across the streetat the Fort Worth Convention Center. Cats and dogs weighing under 25 pounds are permitted. Guests are required to pay a non-refundable cleaning fee of 50.00. Pets must be kept in appropriate cage or kennel when the guest is out of the room. Service animals are allowed and are exempt from weight restrictions and fees. Dallas/Fort Worth International Airport Distance: 20 MinutesShuttle price each way: $17Cab each way: Directions:Exit South ramp to Texas-183 West; Merge onto Texas-183 West toward Fort Worth; Proceed 10.5 miles until Texas-183 West becomes I-820/Texas-121 South; Keep left to take Texas-121 South via Exit 24B toward downtown Fort Worth; Merge onto I-35W South; Take the Texas 280-Spur exit – Exit 52 – toward downtown; Merge onto Texas-280 Spur West; Take the East 6th Street exit on the left; Turn left onto Houston Street/ US-287 BR S; Hotel entrance is on the right across from the Fort Worth Convention Center.